I really like Proctors. 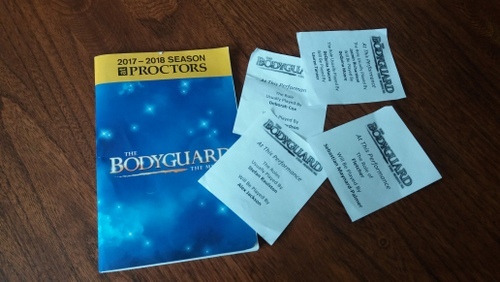 I like theater, I like the role Proctors plays in Schenectady, and I like how they are so efficient that they help promote all sorts of other arts organizations that can’t necessarily get their acts together. This year, for the first year, we became season subscribers. I like the theory of being season ticket holders. On KidsOutAndAbout.com, I am always advocating for people purchasing memberships to their favorite institutions, and it’s really a wonderful way to support what you love, and it’s usually a great financial deal. But I’ve been feeling pretty bitter about the Proctors membership. It is expensive, and it’s more shows than we’d typically see for more money than we’d typically spend. The truth is, we did it all for Hamilton. The entire family loves the Hamilton soundtrack and pretty much has it memorized, and we knew the show was coming next year and that we’d need an “in” to guarantee tickets. So last fall I went to the box office in person because this was an entirely new venture for us, and I wanted to make sure that what I was buying would get what I really wanted: access to decent Hamilton tickets for our family next year. At the time that I purchased, I specifically asked if I could get away with just buying a pair of season tickets for this year and still manage to get four tickets to Hamilton the following year, and I was told that yes, I would. I ended up buying a pair of season tickets to the matinee performances, the cheapest option. Cute W and I figured that, with five shows at Proctors, the girls could potentially miss a day or two of school or he could take a day or two off work and we’d just shuffle around who’d go to each show. That has sort of, mostly worked. Another wrinkle to complicate matters is that M volunteers as a C.A.S.T. member. C.A.S.T. stands for Cultivating Arts & Students together, and it’s a great program for high school students. I highly recommend it as a fun and easy volunteer gig. For several shows each year, M scans the tickets as people come in, and then she is permitted to stay and watch the show for free. I love this idea. There are also adult ushers who volunteer and can stay to watch shows, and I totally aspire to do this one day. So, great shows, but not what I’d normally choose to go see, and even afterwards I didn’t walk out of the theater smiling and humming, which is my goal. This might be just because I am a Deeply Unsophisticated Theater-Goer, but I appreciate entertainment. The closer we got was likely Finding Neverland, which Cute W and I both enjoyed very much. Then came The Bodyguard. This musical’s based on the movie, which was really just a star vehicle for Whitney Houston, and if anything the musical is even worse, plot-wise. It’s a star vehicle, too, for Deborah Cox, but we knew going in that she wasn’t performing in the matinee. Then the number of people who were subbing was so comical that I took a picture of it. And here’s the thing: even these understudies-for-understudies had super-awesome voices. They were so talented, and all of the singing was incredible, but sandwiched between the songs were a plot and script that were, like, painfully bad. Thrown into the mix was a Capital Repertory Theatre show that we wanted to see, but then, between everyone’s activities, we couldn’t make it to the show, and by the time I figured that out, I couldn’t change our show days or times, either. I ended up just giving those tickets away. So, it had been a mixed bag when I went into the box office to purchase next year’s season and find out what I needed to do for Hamilton tickets. We had already decided to switch to evening shows because the daytime had been so tough on our schedule. At the box office, I learned that I’d received incorrect information, and really, the only way to be sure of Hamilton tickets was to go ahead and purchase four season tickets instead of the pair that we’d had. And that meant that we’d need to start over in terms of the location of our tickets, too, putting us much further back. So we’d need to spend twice as much as I’d anticipated, and I was already frustrated. The person I spoke to said that I could try and wait, but it was likely that if I bought additional tickets individually, they’d cost about as much as an entire season. (Alert: if you really want Hamilton tickets, you’re probably better off with season tickets, too. I’m sorry.) So everything I’d heard when I first purchased season tickets was inaccurate. I was so angry and upset that I didn’t even buy the tickets. I was afraid that I was going to be rude, so I left the theater and walked to my car and did some primal screams once I’d shut myself into the vehicle. I am not exaggerating: I actually did this. Luckily there wasn’t an attendant there at the time. Then, I went back a few days later and sucked it up and put us on a payment plan and approved the seats, which are way the hell up in the balcony, and I was so clearly on the verge of tears that the person at the box office was like, “Are you sure you want to do this?” And I answered that it the seats were only going to get worse and more expensive, so yes, I was sure. So, with all of that background, we had The King and I coming up. Cute W, who’d seen the show many years ago with Yul Brenner, was excited for everyone to see it, because he remembered it fondly. He’d recommended that J and I go for the matinee and M could see it for her C.A.S.T. night, and he didn’t need to see it because he’d seen it before. But here’s the thing: the girls don’t like to miss school, and they are not super theater people. They are more into sports. We did not try to mold them into little jocks. We got them signed up for chorus and musical instruments. My first outing ever with infant M was to see theater (Washington Park Playhouse, baby). But that is just how they’ve turned out. J was lukewarm on missing school, and half the time M goes to C.A.S.T. she chooses to skip out after the tickets are taken, which sort of kills me every time, and lately she’s been going out with friends of Friday night, so I expected it might happen again. So for The King & I, I suggested that they could both skip out on school and I’d drive them over to see it, like a sister date. “A sister date!” J gasped. She loved that idea. Suddenly she was super-enthusiastic, and M agreed to go along. Okay. Finally, a fun show and something that we really wanted the girls to see. Hooray. Then, the night before the show, J learned that the high school kids had planned a pick-up volleyball game for after school the next day, and she could join. She is very enthusiastic about volleyball, and she’s been missing it since her club season ended. She’s been diligently practicing by herself in the backyard, which is a bit lonely, plus it is limited because she doesn’t have easy access to a gym with a net, which makes it tough to practice serves. She’s chalked off measurements on the driveway and our garage to simulate an actual court and net, but. . . it’s pretty inadequate. She really, really wanted to go play volleyball. And The King & I is really, really long. I could have insisted that she go to the show, but how fun would that be for anyone? Meanwhile, M had only planned to go along to be nice. She’d rather not miss school or track practice, and she’ll be taking tickets tonight. So suddenly our plans had fallen through and I had two tickets for a show in a few hours. I tried. I texted local friends who have flexible schedules. I thought about putting a call out on Facebook, but, honestly? I feared that someone responding immediately might be someone I didn’t want to hang out with. I didn’t want to leave it entirely up to chance. And then I had other things to get done that morning, so I couldn’t sit around racking my brain about whom else to text. So I went All. By. Myself. Yes, I probably need more friends. And please don’t tell me now that you would have been free and wish I’d called you. I’m sorry that I didn’t. It was a great show. But at this point I was suffering from a bit of a bad attitude in general, and of course the whole making-fun-of-Thai-peoples’-misunderstanding-of-Western-culture is dated, and I thought I remembered that there was more romance in the show than there actually was. The performers were all excellent. But it was also a huge chunk out of my busy day. I worked frantically until it was time to leave, then I was all stressed out as I spiraled up and up (and up) the parking garage looking for a space as the clock ticked (I’d never parked on the roof before, but at least I made it before curtain time). Then the show had run so long and traffic leaving the show was such a pain that after I dashed out and went directly to the school to pick up M, I was so far behind that I didn’t manage to get dinner ready until 8 pm. I think I would really love being a Proctors season ticket holder if I were a retiree with time on my hands. Or even if I had a single ticket along with some girl friends, I could probably make it to most of the shows as a girls’ night out. And it would be so fun to go out for a lovely meal with friends and see a show, even a show I might not normally imagine would be my top choice. But I just think the whole season ticket system fundamentally doesn’t work for families. The theater tries to be flexible, but it’s not flexible enough, especially since I often don’t have details on school and sports obligations until a couple of weeks out. And yes, I try my best to remember that it is so lovely that I am fortunate enough to have the option to purchase these tickets at all, that I am not counting out nickels to buy ramen noodles. Yes, I am fortunate. But not so fortunate that I don’t balance any enjoyment I get from these shows against other things I could be spending that money on, and when I’m at a show sitting next to the extra seat I paid for, it makes it tougher to enjoy the show. I wish that there were a way, say, that you could pre-purchase of a certain number of tickets at a discount and then apply the credit to the shows you really want, maybe on different days. Or a way to get on a list for the non-sold-out performances so that you could fill up a theater last-minute at a discount, because I hate seeing empty seats. That’s no good for anyone. In any case, I am currently making monthly payments for four season tickets for next year. I’m more excited about next year’s shows in general, but I’m still not feeling optimistic about our chances of getting our act together enough for us to be able to actually use all four tickets for each show consistently. So if you want to be on my text list for when I try to unload them at the last minute, let me know. For those reading this who don’t have season tickets, don’t mind traveling to NYC, and want to see Hamilton, the Broadway production has an email list. They send a notice when a block of tickets goes on sale (most popular Broadway shows do this). If you’re ok buying tickets for a show 9+ months out, you can buy Hamilton tickets at regular price (still about $165/ticket, but WAY cheaper than season tickets). We took our family of 5 this way (in 2 shifts), heading down and back on the train the same day (sucking up the late train back). Hmm, might have to add myself to that email list, Erin! And Christine, I didn’t think of the Cap Rep option. . .but it’s also more of a schlep. . . hmmmm.